When you’re dead, your songs won’t matter, so why hold back? If you’re like me – a songwriter and independent recording artist who sells a few recordings online once in a while – from time to time your thoughts inevitably turn to questioning why you bother to write songs in the first place. This usually happens when you’re starting to write songs again for your next album release like I am now. Thinking about writing songs makes you think about what to write about, and that can make your mind wander to the point where you wonder what the point of this craft is. Then if you think well into the future, you realize it’s probably not in the cards for you to write a song that becomes a standard that will live on well past your death. The more you think along those lines, it can lead you to think about why you don’t release certain songs. Hardly anyone buys them anyway. I have a list of my self-ranked songs, some of which I’ve recorded, and some which haven’t even made the cut to record beyond a first take at all. 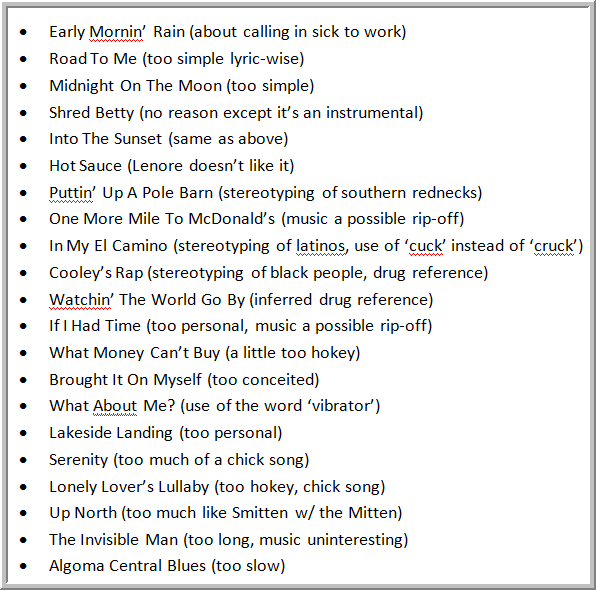 On these lists, next to the song title I write the reason it didn’t make the cut of my own, strange weeding-out methods. They’re abbreviated. My evaluation key, which I also sometimes write next to each song, is like this: Definite Keeper (DK), Keeper (K), Borderline Keeper (BK), Almost Borderline Keeper (ABK). Sometimes I can’t quite decide and will even do a DK/K, or a BK/ABK for the in-betweeners, sometimes later on deciding to bump them up or down for some reason. This is my own method I came up with which sort of evolved after a songwriting friend and I used to rate each others songs with a 1/4K, ½ K, and full K when we were both new to the hobby. 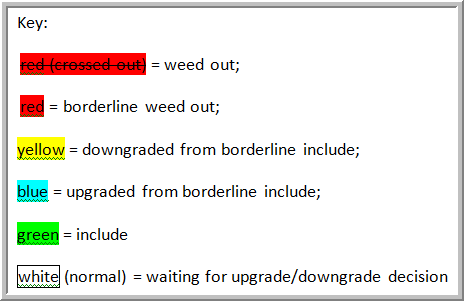 I did color coding on a batch of songs once, using white as “waiting for upgrade/downgrade decision,” and have even done a bold/italics/strikethrough method, but DK/K/BK/ABK is what I’ve settled on. I’ve never released an ABK, but through rewriting, I have actually boosted a few ABKs to BKs, but it’s rare. Also rare are DKs, and I can honestly say I’ve only had a handful of those in twenty-plus years of writing songs. Don’t get me wrong, you probably haven’t heard of any, but if you’re one of my few true fans who’ve bought every album, you might be able to pick some out we’d both agree were DKs. I would hope this would be the case anyway, but one never quite knows for sure which ones others will consider your best. There are many I don’t even bother typing in the list – the definite non-keepers. 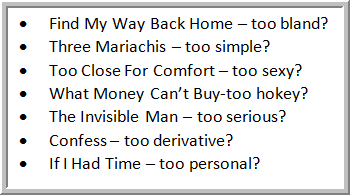 Some of the borderliners end up getting released, some never do, some get moved on to the next album candidate list with specific notes about what to improve when worthy of revisiting for a potential re-write/re-record. There’s always a reason for these designations, and I usually put them in parentheses after the song title, typically only for those that didn’t make it through the final weed-out process. It’s the reasons though that I have to look back on and wonder what state of mind I was in when I wrote them. Some of the reasons might even be funny to some of you out there. I’ve got many, many more reasons I’ve weeded out the hundreds of songs I’ve written you’ve never heard. One of the things you do when you’re all out of new songs to record and having writer’s block is you re-read some of these lists and notes. You start thinking you might’ve had some that were borderline that you could tweak here and there to launch them to keeper status. This rarely works, as I pretty much subscribe to the garbage in/garbage out principle, but it is possible. Sometimes you can have great lyrics that just didn’t work at all with the music, and after a long period of forgetting about the song, you can fit them to a totally different chord progression and melody (assuming you forgot the original melody). Other times you can revist a song title note that says great tune, terrible lyrics, and write brand new lyrics and make it work. You don’t want to waste great musical or lyrical ideas, and you never know when you might have something new that will fit. As I’m in the midst of such a scenario here lately, thinking those “what is the point of all this” thoughts, I’ve come to a new realization: Why not release some of those, since hardly anyone will buy them, and since it’s not going to matter after I’m dead and gone from this world anyway? Some might turn out to be other people’s favorites. Maybe the more controversial, more edgy, more personal, etc., songs would actually be better and more well-received than the universally-appealing, safe stuff I’ve been putting out! Since I have no reputation to begin with, there’s absolutely no danger of it becoming worse. The few true fans out there might be pleasantly surprised. I’ve somewhat already proven to myself that it can work well. I need to do more of this. I’ve received favorable feedback on all of the above. I debated about releasing a song with a swear word in it for an embarrassingly long time, eventually decided to go for it, and lo and behold, it became a fan favorite (Mackinac Island). After that I thought what many an artist has, which is that I didn’t want to give people more of the same so as not to repeat myself and not bore them or bore myself or become known as the artist who writes a particular type of song. Now I’m leaning toward trying hard to not worry so much about what people think and just release away, self-weeding methods be damned. Throw caution to the wind, since in the grand scheme, it will be a drop in the ocean. Maybe this new approach I’m forming will be closer to what true art should be about in the first place. Stay tuned for my 2016 release, as it just may surprise you.